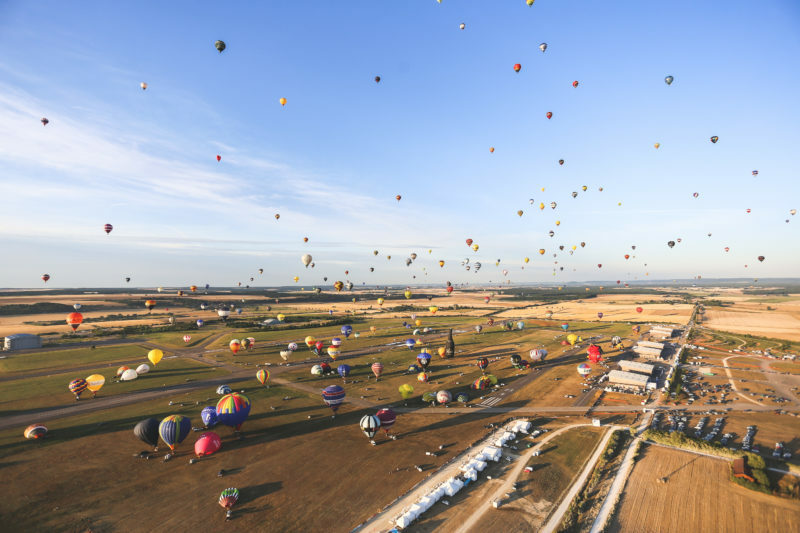 Grand Est Mondial Air Ballons® mobilizes more than 450 people, volunteers and subcontractors, from 11 nations who participate in orchestrating this huge organization, before, during and after the event. It takes to the installation team 1 month to build the event’s site, which covers more than 200 hectares. And 2 weeks to remove everything! The runway on which the balloons pilots set up to try, every two years, to break the takeoff record is 3 km long. The Mondial hosts more than 1300 pilots (including 10% female pilots) and 1 000 balloons, from 70 invited nations. Since 2011, the largest propane station in the world is located on Chambley aerodrome. It has 150 gas filling points and allows pilots during and off the event to fill their cylinders very quickly with gas, necessary to fly. In 2017, during 10 days, nearly 5 000 balloons flights were made, meaning 11 flights out of 19. The control tower also recorded 1,552 movements of other aircrafts, not including the developments of paragliders. During 10 days, 400 000 spectators go to the site. An attractiveness that is explained by the beauty and exceptional nature of the show that is offered in the open sky. Among the visitors, there are Belgian, Luxembourger, Germans tourists but also Americans ones with of course the veterans of Chambley. On the French side, of the 101 French departments, 66 are represented. In 2017, more than 3 000 people had the chance to experience a first flight in hot air balloon, airplane, glider, Ulm or helicopter. Guinness World Records certified since 2013, the Mondial has since improved its own takeoff record twice. In 2017, 456 hot air balloons took off simultaneously in less than one hour. A new world record, which we hope to beat again in 2019! 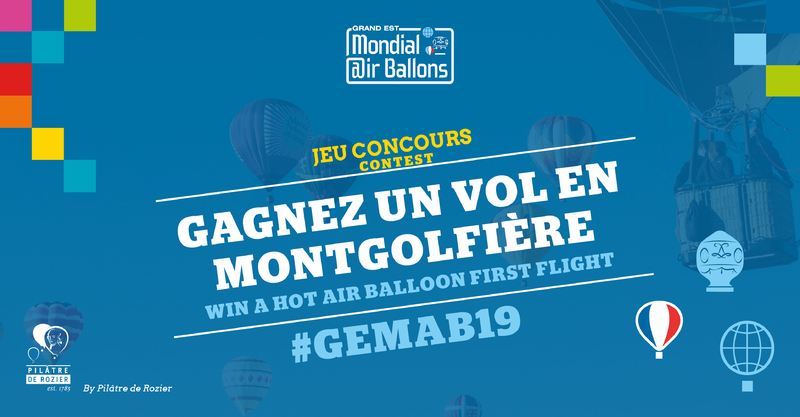 Win a first flight hot air balloon during #GEMAB19! After the 2017 edition contest success, the organizers of Grand Est Mondial Air Ballons® have decided to repeat the adventure. For the 4th consecutive edition, six hot air balloon first flights are bring into play, meaning one flight to win per month, from January to June 2019. Then, six lucky ones will have the pleasure to take off into the air between hundreds of hot air balloons, for an extraordinary flight in a breathtaking setting. The winner will be random drawn and appointed by the bailiff at the end of each month, and will win prize consisting of a hot air balloon first flight and a personalized invitation, a guest parking pass and a welcome in the Club Pilâtre de Rozier at the heart of BallonVille Partner. It is a unique experience in the world that awaits the lucky ones, hurry up to sign up and cross your fingers to be part of them!